Consider: Weyl's Tiles; If space of discrete, then there is some smallest unit of measurement. If there is such a unit, then further division of said unit is impossible by hypothesis. However, if this is the case, then it follows that the Pythagorean Theorem does not hold for some measures of space. Spooky. Where the green line is equal to half of either leg of the square. Moreover, the yellow, and blue stairs are also equal to half of either leg. Of course, this is not what the Pythagorean Theorem would have us believe for say, a staircase of n=10000000 steps. Seems like discrete geometry leads to heretical problems, but wait, off in the distance (though who knows how far? ); It's a point! It's a plane! It's Van Bendegem to the rescue! VB rejects Weyl's Tiles by arguing that lines have thickness, and when taking this into account the Pythagorean Theorem holds. All well and good, and so far, I think right on point. Weyl's Tiles only becomes an issue when considering limiting constructions of lines, such as those with no width. 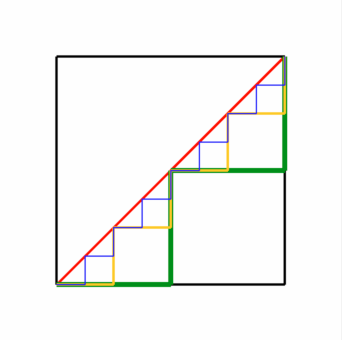 How does the rejoinder work with the Diagonal Argument? It doesn't even need to, since the Diagonal Argument is only paradoxical when excluding possible convergence. 'Taking the limit' of the line leads to Pythagoreanism all the way up the (now nonexistent) stairs. Weyl's Tiles are only an issue assuming the Size Thesis, that is, necessarily the size of any region of discrete space is a function of the number of points that the region has as parts. Without this assumption, Weyl's argument tumbles down like a sack of bad habits. But what would invalidate this assumption? McDaniel has the answer: There are possible worlds where space is (1) perfectly natural, (2) external, and (3) pervasive. (1) Naturalness determines how similar objects are, implies that how properties and relations are instantiated is a consequence of how the internal properties and relations are instantiated, and a property is intrinsic iff it never differs between duplicates. (3) A relation is pervasive iff when aRb and bRc then aRc and R is not necessarily equivalent in each case (cf transitivity in which the function is assumed the same through combinations). In addition, McDaniel holds that proper parts of space are contingent and consequently, there is no necessity tied to whether space is discrete or not. Finally, McDaniel holds the famed theory of Humean Recombination. Here, a contingently existing object x exists at world w, and consequently there is a world w* in which x exists @ w*, every contingent object at w* overlaps x, and for any intrinsic property P, x has P @ w iff x has P @ x*. Also, x overlaps y iff there is some z s.t. z is part of x and z is part of y. Now, the argument against Weyl proceeds as follows: Suppose space is continuous and there are points m,n, and p with non-equal distances obtaining among and between them. Call it something snazzy, like T-Pain. Now, the distance relations are external, and so there are intrinsic properties which supervene on T-Pain, call them Auto-Tune. Now, all of this is obviously contingent, but not-so-obviously, (1) there is a possible world w at which T-Pain exists, (2) every contingent object @ w exists, (3) T-Pain instantiates every intrinsic property in Auto-Tune and (4) every intrinsic property instantiated by T-Pain is Auto-Tuned. Also, w has a discrete space and the only things in w are m,n,p, and T-Pain. But wait, if the Size Thesis is true, recall, then necessarily the size of any region of discrete space is a function of the number of points that the region has as parts. However, in discrete land w, according to this thesis, there is no distance between the points since there are no other components of space in this world and so the distance between points is trivially zero. But distance was an external relation holding among these points, and as such they maintain said relation even in discrete land, which implies that they are unequal. And boom goes the dynamite. Supervenience, I assume you know, but for clarity, is a relational property in which some properties at a lower level determine properties at a higher level. So, for instance, consider a painting, any painting. Changing aspects of the painting like pigment and hue will change the perceived physical properties of the painting, and so these properties supervene on the pigment and hue among other things. Now, I have a sinking suspicion that Externality begs the question of this entire argument, but I will leave this aside for something more interesting. If external relations do not supervene on intrinsic properties, then such properties are independent of such relations. When fused with other objects, however, dependent relations emerge among the objects. Distance is such a relation that emerges from fusion. McDaniel seems to think this follows from naturalness and cites Lewis's "On the Plurality of Worlds," to that effect, but Lewis's argument at best shows that distance, when conceived as a non-intrinsic property, does not supervene. When considering a world where being embedded in a certain space-time point, say, a discrete point, is an intrinsic feature of an object, then externality fails. But isn't this precisely what McDaniel's did by hopping from w to w* with Hume's help? Of course, McDaniels did say this was merely an argument for metaphysical possibility, and as such, it is only necessary to show that this argument goes through for some world. It would be much more difficult to argue against this, perhaps, by showing that externality is impossible in all worlds. Challenge accepted. What was your intuition towards thinking that externality begs the question of the entire argument? It seems intuitive to me to describe distance in terms of multiple objects, thus requiring a fusion. There can be no distance in a single object, thus it is not an intrinsic property (as you already showed), but when two objects are fused, new intrinsic properties of the fusion are thus formed. I would be tempted to say that distance is one of these intrinsic properties of the fusion, and McDaniel seems to think it supervenes on the fusion. This makes sense to me only because if one were to change the distance between two objects, it would indeed change the overall fusion of the objects as a whole (i.e. they would seem closer or farther apart). Now for your thought provoking comments! McDaniel seems to think [that distance is an external relation] follows from naturalness and cites Lewis's "On the Plurality of Worlds," to that effect, but Lewis's argument at best shows that distance, when conceived as a non-intrinsic property, does not supervene. When conceived as a non-intrinsic property of an object, or the fusion of objects? If he is referring to the fusion of objects then I would agree that it doesn't supervene, although it seems odd to me to think it non-intrinsic. When considering a world where being embedded in a certain space-time point, say, a discrete point, is an intrinsic feature of an object, then externality fails. But isn't this precisely what McDaniel's did by hopping from w to w* with Hume's help? Of course, McDaniels did say this was merely an argument for metaphysical possibility, and as such, it is only necessary to show that this argument goes through for some world. So if it's an intrinsic property of the discrete point (a single object), how does that relate to distance, which is a relational property among multiple objects? Does it necessitate that for a property to be intrinsic in the fusion of objects, it must be intrinsic in each object prior (I'm not very knowledgeable with metaphysical logic)? At best, I think McDaniel merely shows metaphysical possibility. I'm going to attempt to add support to the idea that we do actually live in a discrete world by demonstrating how continuous distance relations still hold in discontinuous discrete space (sounds stupid when I write it down) as well as how motion in a discrete world takes place (much easier since we already have some evidence via quantum mechanics). If so, I think we've just shown that it is possible to get accurate (if that's really the right word to use in this scenario since we're using continuous measurements for discontinuous objects.. weird) distance measurements in our discrete world. I think, in non-metaphysical terms, we do this daily. The fact that we qualitatively experience a continuous world is the only reason, that I can come up with, that we believe continuous theorems to be true. I'm all for the Pythagorean Theorem, and I think it's important that it can be shown to hold in a discrete world macrospcopically (as I'm attempting to do), but I think it's much more interesting to consider the really freaking cool questions about distance in a discrete world on the really really small level where there seems to be 'nothing' between discrete proper parts of space. Why should it be the case that continuous maths hold on a microscopic level? I think physics has already shown us that we're wrong (although I don't think a proof can be wrong, just not applicable - a discussion on the validity of proofs would be cool, but that's way off subject) but I'd love your opinion. Two things: First, I am going to start saying 'gucci' all the time now.